Learning how to knot will help to extend your design possibilities when working with beads. Knots are essential part of Chinese knotting, macrame, and braid making. 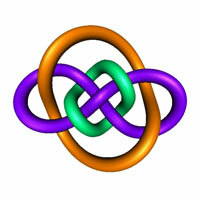 Knots are also used as spacers between beads. This was especially true in the past when beading threads were not a strong as they are these days. Knotting between beads meant that should the thread break, the person would not lose all their beads!! Obviously knots are not as essential as they once were in stringing your beads. Apart from saving your beads should the thread break, the knots also prevents fraying of thread between beads as in the case of beads with rough holes. And they can give a very unique look to your design when using decorative knotting. Knots between beads they are still very popular especially with pearls. Pearls continue secreting enzyimes that can corrupt threads. The knots definitely help in preventing loss of precious pearls should a break occur. However with precious pearls, it is advisable to have them restrung every now and then. The type of knot you will use will depend on the type of beads you have. Waxed thread or thread with conditioner helps in working with knots as it makes it easier to slide knots. With the use of any knots, consideration should always be given to the thickness of the thread in relation to the size of the beads.